vi+331 pages with frontispiece, diagrams and index. Royal Octavo (9" x 6"). Bound in black cloth with gilt lettering to spine and gilt embossed rook and blind stamped ruled edge to cover. 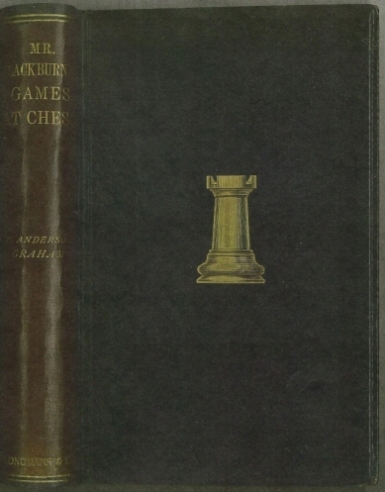 Edited, with a biographical sketch and a brief history of blindfold chess by P Anderson Graham. (Van der Linde-Niemeijeriana 3036)(Betts 29-15) First edition. 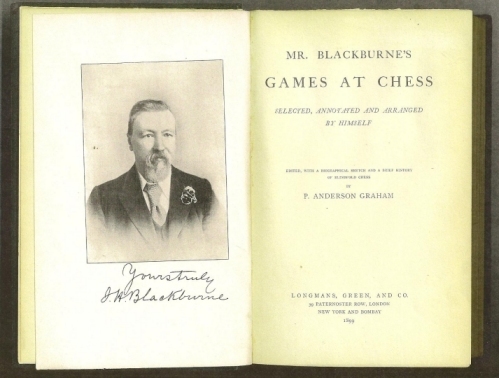 Blackburne's international tournament career spanned an impressive fifty-two years from London 1862 to St Petersburg 1914, a total of 53 events in which he played 814 games scoring over 62%. Although he rarely won international events, he generally finished in the top half of the table and his fierce competitive spirit coupled with his great combative ability earned him the pleasant nickname of "the Black Death". His most notable successes were = 1st with Steinitz at Vienna 1873 (Blackburne lost the play-off match). 1st at Berlin 1881 ahead of Paulsen, Schallop, Chigorin, Winawer and Zukertort and 2d to Tarrasch at Manchester 1890. Blackburne won the BCA championship in 1868 and for many years was ranked as Britian's foremost player. In 1914, at the age of 72, he shared first prize at the BCF congress in Chester. Spine ends repaired with new end papers, previous owner's name on front end paper and verso of frontispiece else a very good copy issued without a jacket.